USSR: Striking Cotton Workers at the Teikovo Calico works outside Moscow, organize a march to petition party authorities for food. Security troops come in and arrest the ringleaders. Germany: In the first step leading to the Final Solution, the Nazis issue the so-called Aryan Paragraph (arierparagraph) which defines a non-Aryan as anyone descended from a non-Aryan, especially those with at least one Jewish parent or grandparent. 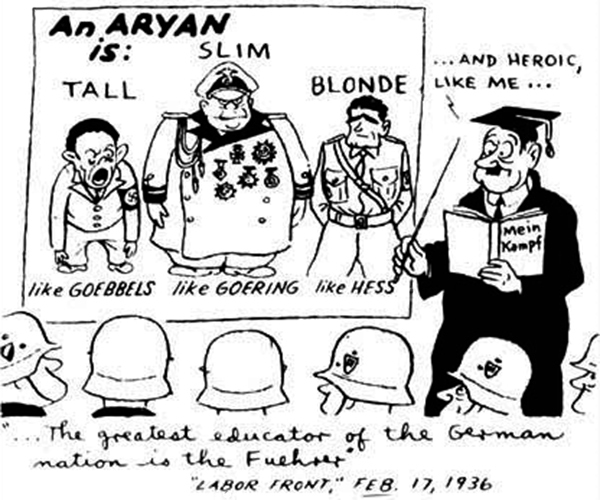 This 1936 cartoon from the Chicago Daily News pokes at the absurdity of the Third Reich's notion of an "Aryan" race with a leadership that doesn't even come close to fitting into their own model. The Aryan ideal during WWII was a backwards ideology fueled by a twisted, invented pseudo-science that had existed long before Hitler came along. It had been a tool used by European autocrats to justify their actions and get what they wanted. The Nazis, too, used perverted science to support their claims and to justify their actions in pursuit of getting what they wanted. CBI - China: Day 101 of 142 of the 1st Battle of Hebei. Japanese troops capture Lengkou. Europe: Triggered by Germany's declaration of its intention to build up an air force and its army, England, France and Italy meet in Stresa, Italy, and sign the "Stresa Front" agreement to reaffirm European boundary agreements of the Locarno Pact of 1925. 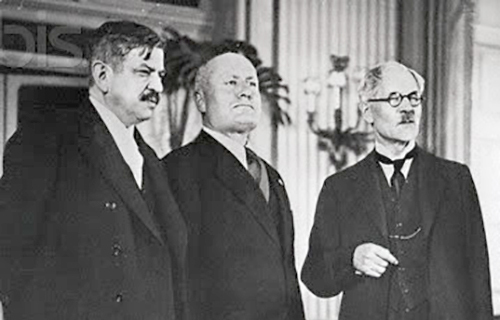 The three agreed to be a united front to resist any future attempt by Germany to alter the Treaty of Versailles. However, for Mussolini, this was merely a chance to portray himself as a keeper of the peace. He believed that the signing of the Stresa Front would mean Britain and France would not interfere in the brewing Abyssinian crisis. The Stresa Front could be seen as a failure due to its vague terms and the fact that it was not clear how its aims should be upheld. It ignored all references to Germany, as Britain was adopting a dual policy and did not want to antagonize Hitler. The hard line was provided by Mussolini, while Britain 'kept the door open' with Germany in order to obtain agreements. Hitler had used tactics that made Britain and France guess at what his next move would be. However, because of the vague terms here, it kept Hitler guessing at what Britain would do as well. Spain: Day 269 of 985 of the Spanish Civil War. Spain: Day 634 of 985 of the Spanish Civil War. CBI - China: Day 279 of 2,987 of the 2nd Sino-Japanese War. Day 64 of 124 of the Battle of Henan. Day 19 of 39 of the Battle of Xuzhou. CBI - China: Day 644 of 2,987 of the 2nd Sino-Japanese War. Day 26 of 54 of the Battle of Nanchang. Atlantic: British sub HMS SPEARFISH damages the German pocket battleship LUTZOW, knocking it out of action for one year. Atlantic: British troops occupy the Faroe Islands between Scotland and Iceland. ETO - Norway: Day 3 of 63 of the Battle of Norway. The RAF bombs Stavanger airfield on Norway's west coast. CBI - China: Day 1,010 of 2,987 of the 2nd Sino-Japanese War. Day 149 of 381 of the Battle of South Guangxi. USA: President Roosevelt proclaims that the Red Sea is no longer considered a war zone, so it's now available for US shipping. Atlantic: German sub U-124 sinks the Greek ship AEGEON 200 miles southwest of Freetown, Sierra Leone. ETO - UK: Day 218 of 258 of the Blitz. The Luftwaffe bombs Bristol, nicknaming it the "Good Friday Raid." The bombs that hit the St Philip's Bridge destroy the power supply that run the city's tramways. All tram cars are scrapped for the war effort. ETO - Germany: French Lieutenant Alain le Ray becomes the first Allied serviceman to escape from Colditz Castle, which is used as a prisoner of war camp in Germany. MTO - Yugoslavia: Day 6 of 12 of the Axis invasion of Yugoslavia. Italy and Hungary join the German invasion of Yugoslavia. MTO - Greece: Day 6 of 25 of the Battle of Greece. German troops capture Vevi. Later in the evening, UK troops engage the Germans at Vevi for the first time in Greece. MTO - Libya: Day 2 of 256 of the Siege of Tobruk. Rommel tries to capture Tobruk but the 9th Australian Division repels his attack. East Africa: Day 306 of 537 of Italy's East African campaign in the lands south of Egypt. Nigerian troops (British 11th African Division) march from Addis Ababa toward Jimma in Abyssinia while the Indian 5th Division marches from Massawa, Eritrea, toward Amara, Abyssinia. CBI - China: Day 1,375 of 2,987 of the 2nd Sino-Japanese War. CBI - Thailand: Day 193 of 221 of the Franco-Thai War (Vichy France vs Thailand). Atlantic: Day 88 of 169 of Germany's Second "Happy Time," during which U-boats sink 609 Allied ships with little risk. U-203 damages US tanker HARRY F SINCLAIR JR southeast of Swansboro, North Carolina, killing 10 of 36 aboard. Further to the east, U-160 sinks the British ship ULYSSES. ETO - Germany: A British RAF Halifax bomber drops the first 8,000 pound bomb on Essen. Russian Front - North: Day 216 of 872 of the Siege of Leningrad. Russian Front - North: Day 63 of 102 of the Battle of the Demyansk Pocket, another failed attempt to break the siege at Leningrad. Russian Front - North: Day 79 of 103 of the Battle of the Kholm Pocket. Another attempt to break the siege at Leningrad. The Germans make progress to relieve their surrounded forces at Kholm. Russian Front - Center: Day 94 of 103 of the Battle of Vyazma, Russia. Russian Front - Center: Day 94 of 103 of the Battle of Sychevsk, Russia. Russian Front - Center: Day 40 of 49 of the Battle of Rzhev, Russia, a diversion to pull more German troops away from Moscow. Russian Front - South: Day 164 of 248 of the Siege of Sevastopol, Crimean Peninsula. The Soviets attempt a landing near Eupatoria but are halted by the Germans. CBI - Burma: Day 119 of 164 of Japan's Invasion of Burma. Day 1 of 9 of the Battle of Yenangyaung. The Allies will hold this piece of the Burma Road. CBI - China: Day 1,740 of 2,987 of the 2nd Sino-Japanese War. PTO: The submarine USS THESHER provides a weather report on Tokyo for the Doolittle Raiders who are already on their way. PTO - Malaya: Day 52 of 357 of the Battle of Timor Island. The USS SEA RAVEN evacuates 33 Australian Army personnel. PTO - Philippines: Day 125 of 152 of the 1st Battle of the Philippines. Germany: The SS doctors at concentration camps are given orders to select prisoners to be sent to Hartheim Castle in Austria to be euthanized. Russian Front - North: Day 581 of 872 of the Siege of Leningrad. Russian Front - North: Day 342 of 658 of the Siege of the Kholm Pocket. MTO - Tunisia: Day 146 of 178 of the Battle of Tunisia. RAF and US Air Forces provide Allied air support. Allied troops capture Kairouan, 100 miles south of Tunis. CBI - Burma: Day 63 of 79 of the Allied Operation LONGCLOTH. US 10th Air Force provides air support. CBI - China: Day 2,105 of 2,987 of the 2nd Sino-Japanese War. PTO - Alaska: Day 309 of 435 of the Battle of Kiska, Aleutian Islands. US 11th Air Force hits Kiska Island five times throughout the day. PTO - Solomon Islands: Day 11 of 16 of Japan's Operation I-GO. 50 Allied fighters scramble from Dobodura and intercept a force of 22 "Vals" and 72 Zeros attacking shipping at Oro Bay, near Buna, shooting down six Japanese aircraft without loss. ETO - Belgium: US 9th Air Force B-26s and A-20s attack military installations on the coast and the Chievres airfield. ETO - Netherlands: The Gestapo HQ in The Hague is attacked and destroyed by RAF Mosquito aircraft. Lost in the raid are files of individual Dutch nationals scheduled to be deported to Nazi camps. ETO - Germany: US 8th Air Force: B-17s and B-24s bomb production centers in northern Germany. ETO - Switzerland: Swiss authorities destroy the new German BF-110 aircraft that was brought into Switzerland by a defector. In return, Hitler gives Switzerland 12 ME-109s fighters. ETO - Switzerland: A US delegate hands the Swiss government a check for 1 million dollars as reparations for the accidental bombing of Schaffhausen on 1 Apr 1944. Germany: The German SS orders that prisoners who have committed sabotage are to be publicly executed. Russian Front - North: Day 70 of 191 of the Battle of the Narva Isthmus, Estonia. Both German and Soviet troops remain in their defensive positions. Russian Front - South: Day 110 of 113 of the USSR's Dnieper-Carpathian Offensive in southwestern Ukraine. Russian Front - South: Day 39 of 45 of the Battle of Chernovtsy, Ukraine. Russian Front - South: Day 37 of 44 of the Battle of Snigirevka, Ukraine. Russian Front - South: Day 4 of 35 of the Battle of the Crimea. The Soviets capture Kerch and Dsjankoi. Russian Front - South: Day 17 of 20 of the Battle of Odessa, Ukraine. Russian Front - South: Day 4 of 60 of the Battle of Romania, 1st Jassy Offensive. MTO - Italy: Day 86 of 123 of the Battle of Monte Cassino. RAF and US Air Forces provide air support. MTO - Italy: Day 81 of 136 of the Battle of Anzio. RAF and US Air Forces provide air support. CBI - Burma: Day 38 of 166 of the UK's Operation THURSDAY. CBI - Burma: Day 33 of 147 of the Battle of Myitkyina. US 10th Air Force provides air support. CBI - Burma: Day 11 of 302 of the Chinese Salween Offensive. US 14th Air Force provides air support. CBI - China: Day 2,471 of 2,987 of the 2nd Sino-Japanese War. CBI - India: Day 35 of 118 of the Battle of Imphal-Kohima. Day 1 of 4 of the Battle of Bunker Hill outside Kohima. CBI - Indochina: US 14th Air Force hits railroads north of Vinh and seriously damage a bridge south of Thanh Hoa. PTO - Alaska: US 11th Air Force B-24s bomb the runway on Matsuwa Island. PTO - New Guinea: Day 43 of 80 of the Battle of the Admiralty Islands. 5th Air Force provides air support. PTO - New Guinea: Day 206 of 219 of the Battle of Shaggy Ridge. 5th Air Force provides air support. PTO - New Guinea: Day 119 of 597 of the Battle of New Britain. US 13th Air Force provides air support. The majority of New Britain Island is now held by the Allies. PTO - Solomon Islands: Day 163 of 295 of the Battle of the Bougainville Islands. US 13th Air Force provides air support. ETO - France: Day 256 of 284 of the Battle of Brittany. ETO - France: Day 209 of 236 of the Siege of Dunkirk. ETO - Germany: Day 37 of 46 of the Battle of the Ruhr Pocket. US 9th Air Force provides air support. The British 2nd Army captures Celle while the US 9th Army takes Bochum, Essen and Goslar. ETO - Germany: Day 8 of 9 of the Battle of Heilbronn. ETO - Germany: The US 3rd Army takes the historic town of Weimar while the US 7th Army reaches Schweinfurt. ETO - Germany: Prisoners of Buchenwald free themselves after the guards have fled. At the satellite camp of Langenstein, the US 83rd Infantry Division arrives to liberate them. ETO - Germany: American troops capture an intact V-weapon plant in Nordhausen. Top engineers are sent in to remove as much equipment as possible before the arrival of Soviet troops. ETO - Germany: US 8th Air Force B-17s and B-24s bomb a variety of targets in Germany. Russian Front - Finland: Day 209 of 223 of the Lapland War. Finland and Russia have joined forces to kick the Germans out of Finland's most northern province. Russian Front - Center: Day 179 of 206 of the Battle of the Courland Pocket in Latvia. Russian Front - Center: Day 58 of 83 of the German Siege of Breslau (today Wroclaw, Poland). The Soviets continue with their siege. Russian Front - South: Day 17 of 21 of the Battle of Nagykanizsa-Körmend, western Hungary. Soviet troops reach the Elbe River near Magdeburg, Germany. Russian Front - South: Day 30 of 34 of the Battle of Vienna, Austria. The Soviets reach the center of Vienna, capturing the parliament and town hall buildings. MTO: US 15th Air Force hits targets in Italy, Germany, Austria and Czechoslovakia. MTO - Italy: Day 6 of 27 of Operation GRAPESHOT, a successful offensive in northern Italy. MTO - Italy: Day 3 of 13 of the Battle of Bologna. CBI - Burma: Day 67 of 99 of the Battle of Pakokku and Irrawaddy River operations in central Burma. The US 10th Air Force provides air support. CBI - China: Day 2,836 of 2,987 of the 2nd Sino-Japanese War. Day 11 of 91 of the Battle of Zhijiang. US 14th Air Force provides air support. Day 3 of 60 of the Battle of West Hunan (near Zhijiang). PTO - Alaska: US 11th Air Force P-38s with US Navy planes pick up Japanese bomb-filled paper balloons over Attu and east of Adak Islands in the Aleutian Islands. One balloon over Attu is shot down and portions of the gondola are recovered in Massacre Bay. PTO - Japan: Day 11 of 83 of the Battle of Okinawa. The USS MISSOURI, USS ENTERPRISE, USS ESSEX and 6 destroyers are damaged by a Japanese special attack aircraft off Okinawa. The remains of the Japanese pilot are given a sea burial with military honors. PTO - New Guinea: Day 471 of 597 of the Battle of New Britain. US 10th Air Force provides air support. PTO - New Guinea: Day 355 of 481 of the Battle of Western New Guinea. US 10th Air Force provides air support. PTO - Philippines: Day 174 of 299 of the 2nd Battle of the Philippines, aka the Liberation of the Philippines or the Philippines Campaign. PTO - Philippines: Day 118 of 244 of the Battle of Luzon. 5th Air Force provides air support. PTO - Philippines: Day 33 of 159 of the Battle of Mindanao Island. 5th Air Force provides air support. PTO - Philippines: Day 25 of 135 of the Battle of the Visayas region. US 5th and 7th Air Forces provide air support. A definitive and comprehensive book on one of history's darkest chapters.